Energy in our region: Not all of the jobs that were lost in the past ten years were to developing countries with lax regulatory oversight and low wages, many jobs were lost to advancements in technology and related productivity gains. Because the region has many companies that are working within energy related fields, developing breakthrough technology in energy production will be critical for advancing the industry cluster and the region. Increase energy efficiency: Create a more energy efficient region through working with utilities and emphasizing energy efficiency. Employ education and outreach to capitalize on technological advancements in energy including smart grid technologies and renewable energy conducive to our region such as geothermal, solar, wind, biomass, energy storage and hydro power. In 2012 the Brainerd Lakes Regional Airport added a large solar air heat installation to their facility. To view the 2012 -2013 Data Airport Click Here. For more information on the project, you can watch the following You Tube video and read this press release Efficiency at Brainerd Regional Airport. 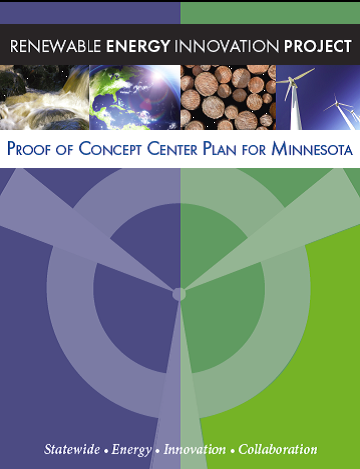 Building a strong culture of collaboration around cutting-edge renewable energy technologies, a Minnesota Renewable Energy Proof of Concept Center will draw on inherent sector strengths in higher education research, community leadership, entrepreneurs, and a broad array of business innovators. By harnessing these diverse talents, shared in a common vision, an economic awakening can deliver a dynamic Minnesota renewable energy cluster marketed with global reach. This highly inclusive process drawn from wind, biomass, solar and other ascendant renewable capabilities offers substantial job-creation potential throughout the state. Want to learn more? Interested in becoming involved with this work? Contact Dawn Espe at Region Five Development Commission and she will put you in touch with one of the theme champions.